﻿ The United Nations: What Went Wrong? The United Nations was formed in 1945 as a replacement to the League Of Nations, which had sought, but abjectly failed, to maintain world peace after the Great War. The Objectives of the UN were noble and grand: primarily to achieve and maintain world peace, but also to promote greater international co-operation on human rights and social and economic development. Although the UN has had some peacekeeping successes, such as Korea in the 1950s and the first Gulf War of the 1990s, its failures are many. Notable examples include the Second Gulf War, where the UN failed to prevent an invasion of Iraq by NATO forces, despite the fact that the invading forces, primarily the UK and USA, were also drawn from two of the five primary members of the UN’s Security Council (the main arm of the UN charged with maintaining world peace). A similar situation arose in the ongoing Afghan War where again, despite a refusal of the UN to ratify invasion, the US, and later the UK, nevertheless invaded unilaterally. Today, we have a situation in the Middle East, primarily in Syria and Iraq where, perhaps due to the perceived failure by many of the military operations in the likes of Iraq and Afghanistan, there is a reluctance, even by the self-righteous (and generally right-wing) governments of the US and UK, to intervene militarily: the result, as we can see on our t.v. screens every day, is thousands, according to recent sources, of innocent lives being annihilated, many of them women and children - people hopelessly caught up in the conflict of those toting the weapons. The UN observers have entered Syria, but in situations like this words and mandates are no serious intimidation to military leaders hell-bent on oppression by force. Regardless of the rights and wrongs of the invasions of Iraq and Afghanistan, and there are arguments on both sides, sometimes military intervention is necessary. It could be argued that war against the fascist dictatorship of Nazi Germany and its allies was one war that had to be fought: one where all attempts at conciliation had failed and where the last defence of commonly held standards of decency and democracy was to fight. It might follow that military intervention in situations such as that which we see in Syria today should follow a similar logic. But military invasion is always a dangerous gambit when not all of the players are playing with the same set of rules. Such unilateral action fuels the conviction of terrorists and military dictators, who can argue the point that it is born of imperialistic motives, and who see the lack of unified opposition as almost a vote of support by default. This lack of cohesion has haunted the effectiveness of UN policy throughout its history. If common decency was the sole factor, UN forces would probably be in Iran now; but unfortunately, the main members of the UN Security Council – the US, UK, France, China and Russia – as well as the other ten members, have a diverse set of goals and aspirations, not least because of their differing political and economic beliefs, and consequently China and Russia are refusing to endorse such intervention. There are perhaps three fundamental flaws with the UN’s peacekeeping structure: the fact that not all member nations are involved in the Security Council; the fact that those that do have diverse aims; and thirdly, that the UN has no direct control over troop deployment, since the forces that make up its armies are in effect under the control of its member nations. The former could probably be resolved, and is partly a problem of mistrust and pomposity amongst the larger nations, which sees it as advantageous to exclude the others; the latter two are far more intractable, and go to the heart of the problems manifest with the very concept of the nation state. For, whilst diverse political, economic, and even religious goals exist amongst nation states, they will forever muddy the waters about what is morally right. There is, of course, no easy solution. Time, one might hope, in a world of ever-increasing globalisation, will serve to break down the old national boundaries and partisan distrust. It has been argued in a separate article that a move towards a more global government is the only way we can all (eventually) live in relative harmony, but it’s clear that there will long be massive opposition worldwide to such a concept – perhaps until global famine or global holocaust, or both, forces it upon us. Meanwhile, in the real world of here and now, whilst the politicians of the Security Council and the national assemblies of its member states debate around the tables, countless innocent lives, untold potential of the human race, are being lost in conflicts across the globe, which, despite its noble aims, the UN has been largely powerless to suppress. Only when there is a true representation of all the countries around the world (which already form membership of the greater United Nations organisation), and a resolve that all members honour a democratically reached resolve to intervene in circumstances such as we see in Syria today; where the values of human decency and true democracy override political, economic and religious self-interest, will we see the UN’s grand vision of world peace and co-operation bear fruit. In the meantime, perhaps we should at least honour that vision: the UN does much work for global harmony in its other guises, such as the FAO (Food and Agriculture Organisation) and WHO (World Health Organisation), and the founders of the UN may also, in time, be seen as founding fathers of a world in which all can share fairly and peacefully, without fear of the gun and the sword. Note: this article will shortly be revised and expanded. (This is the first in what will be a series of ‘What Went Wrong?’ articles). 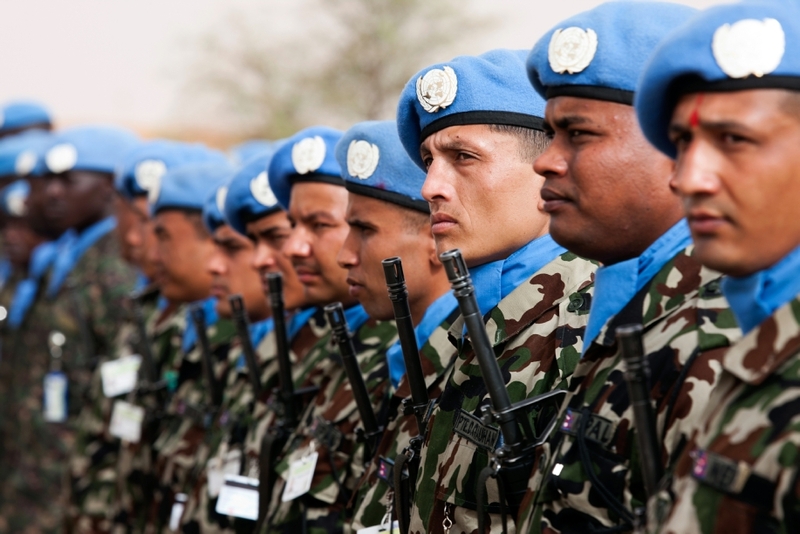 Illustration: UN Peacekeepers in Darfur, May 2012. Source: UN Multimedia.org. (Article uploaded 07-06-12. Subject to further editing). You can discuss this article on the forums, here. See also Blog entry for June 2nd. 2012.